In 88 B.C. it seems as if all the world is at war. From Rome to Greece and to Egypt itself, most of civilization is on the verge of war. The young Gordianus--a born-and-raised Roman citizen--is living in Alexandria, making ends meet by plying his trade of solving puzzles and finding things out for pay. He whiles away his time with his slave Bethesda, waiting for the world to regain its sanity. But on the day Gordianus turns twenty-two, Bethesda is kidnapped by brigands who mistake her for a rich man's mistress. If Gordianus is to find and save Bethesda, who has come to mean more to him than even he suspected, he must find the kidnappers before they realize their mistake and cut their losses. Using all the skills he learned from his father, Gordianus must track them down and convince them that he can offer something of enough value in exchange for Bethesda's release. As the streets of Alexandria slowly descend into chaos, and the citizenry begin to riot with rumors of an impending invasion by Ptolmey's brother, Gordianus finds himself in the midst of a very bold and dangerous plot--the raiding and pillaging of the golden sarcophagus of Alexander the Great himself. New York Times bestselling author Steven Saylor returns, chronicling the early years of his detective, Gordianus, before he assumed the title of The Finder. 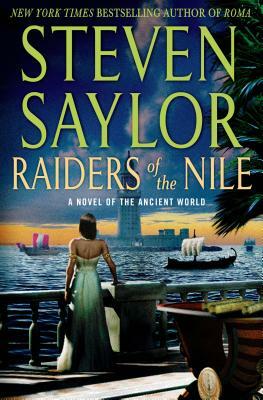 Raiders of the Nile is the latest in his much-loved series of mysteries set in the late Roman Republic. STEVEN SAYLOR is the author of acclaimed historical mystery novels featuring Gordianus the Finder, including The Triumph of Caesar, as well as the internationally bestselling historical novels Empire and Roma. He has appeared on the History Channel as an expert on Roman politics and life. He divides his time between Berkeley, California, and Austin, Texas.